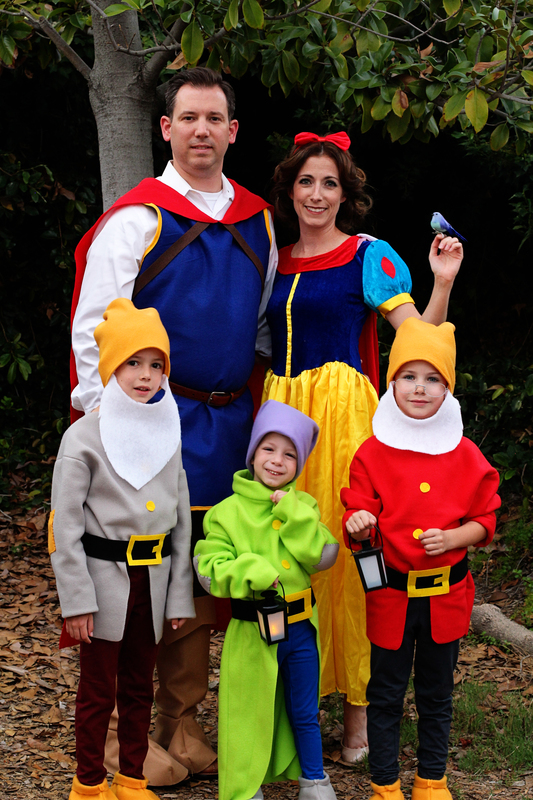 So, you want to dress as characters from Snow White and the Seven Dwarfs? You can totally do this! 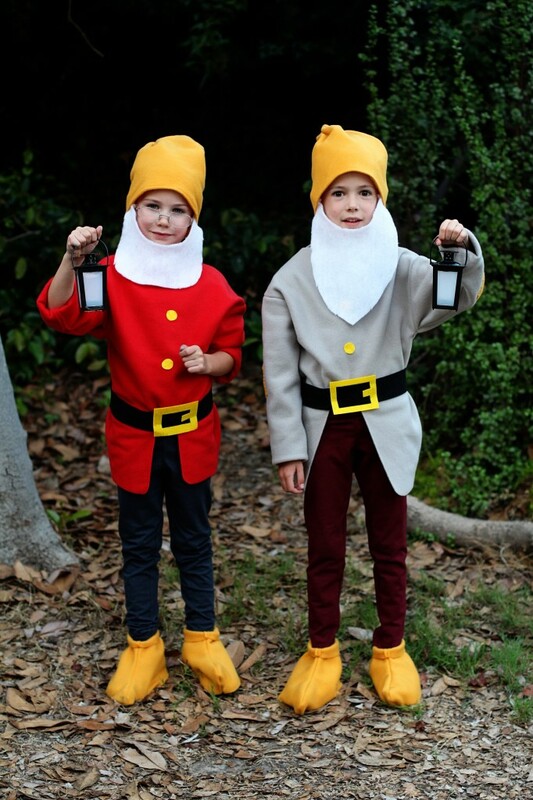 I do not make clothes, but was able to make dwarf costumes pretty easily. I made enough accessories for the prince that he looked homemade too! I’ve searched through my photos, and just cannot find photos of the process, but I can definitely tell you how I went about it. I took each kid’s sweatshirt, turned it inside out, and used it as a pattern for the top. I made sure it would be baggy, just like the dwarfs’ shirts. I found fleece draped most like the dwarfs’ shirts did in the movie. I didn’t finish the edges of the shirt. The neck hole is big so his head can get through, and the beard covers any gaping. The sleeve edges are just tucked in, and they don’t try to come out. This way there aren’t distracting seams. Lazy? Yes. Yes, I am. I had to make three! For Dopey, I made the shirt the same way, except made it extra long, and attached a cowl neck. Doc’s sleeves are rolled up, just like the movie. I watched the scenes of the movie where the dwarfs walk and dance, repeatedly to get an idea of how the pants should fit. I settled on leggings for the right fitted-ness for this look. Luckily, Target had just the right colors. Yes, I ordered a few sizes to be sure to get the right tightness. My oldest and I had to repeat scenes over and over to agree on the colors we were seeing. That movie is dark and muted! The hats are also fleece, again to get the right movement. I measured each kid’s head and cut the fabric VERY long. I sewed the hat up the side, then gathered the end and sewed it in an X. It was long enough to droop just right. 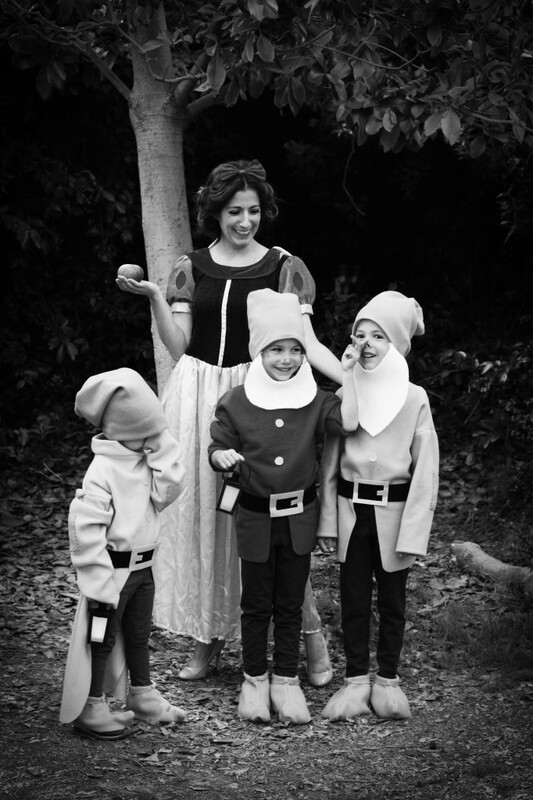 The dwarfs’ hats weren’t pointy, so I had to make sure they didn’t come to a point. There may be a better way of doing this. I’d never made a hat before. It worked. I didn’t finish the edge around the face, because I didn’t want a seam showing, so I just tucked it under and it stayed put. For the shoe covers, I measured around each kid’s shoe and added extra at the front for a bit of a point. The dwarfs don’t have curled elf shoes, but they do have subtle points. I left a little extra at the top to mimic the bit of cuff the dwarfs had. The belts are made of felt. Pretty straight forward. I measured them with the shirts on, and sewed a felt buckle decoration on. I think I stitched one end of the belt to the shirt to keep it from moving out of place, and I attached a bit of Velcro to keep them closed. I cut out little circles of felt for buttons and stitched them down the front. I cut elbow patches from fleece and hand-stitched them loosely using big stiches with doubled thread. I cut a beard from white felt, shaped to each kid’s face. I finished the edges with feathering cuts. I stitched both ends of the beard to the hat. The glasses and lanterns are from Dollar Tree. Lanterns are available in the springtime. The prince wore a white dress shirt, because that’s what we had. A shirt with looser sleeves would be perfect. We got leggings from Walmart. I used a shirt as a pattern for dimensions for the tunic. Very straight forward. Shape to armpits and make it long (almost to knees). I trimmed with gold fleece. He wore his own belt. I added “leather” straps across the chest, using felt. Last, I added a cape, sewn onto the tunic, draping down to the calves. The shoe covers were made by measuring his shoes and extending up over the knees, so they could be folded down later. 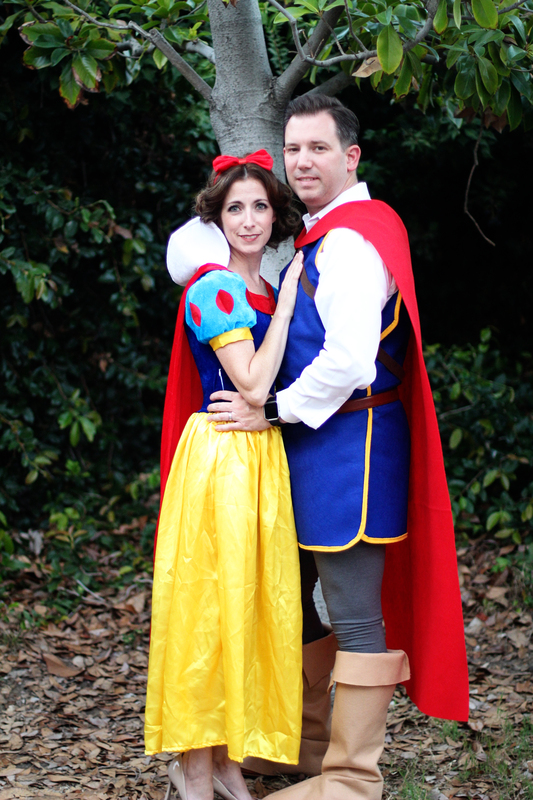 Snow White’s dress was purchased, because it was inexpensive, and I don’t know how to make clothes! Bird found at Michael’s and I attached an elastic loop so I could wear it, until I gifted it to my favorite little Snow White I got to play with on Halloween. I youtubed the Snow White hairstyle, which worked well, and that’s saying a lot from this inept hair stylist. 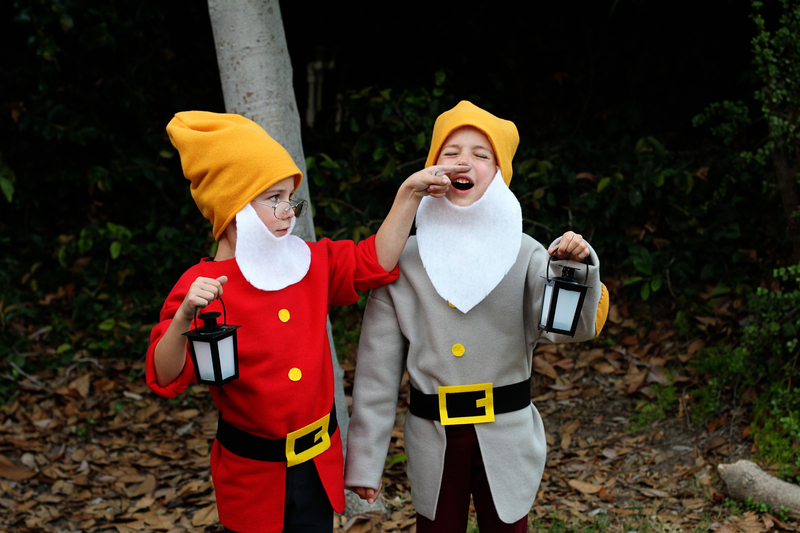 We had a lot of fun in these costumes, because they just aren’t found in stores, and making them allowed us to do something we couldn’t otherwise do. 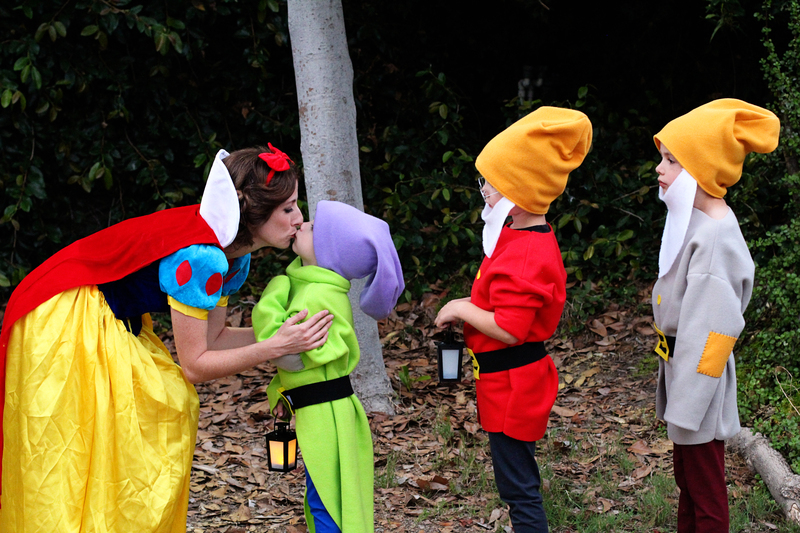 I hope you have fun with your Snow White costumes! Post pics! 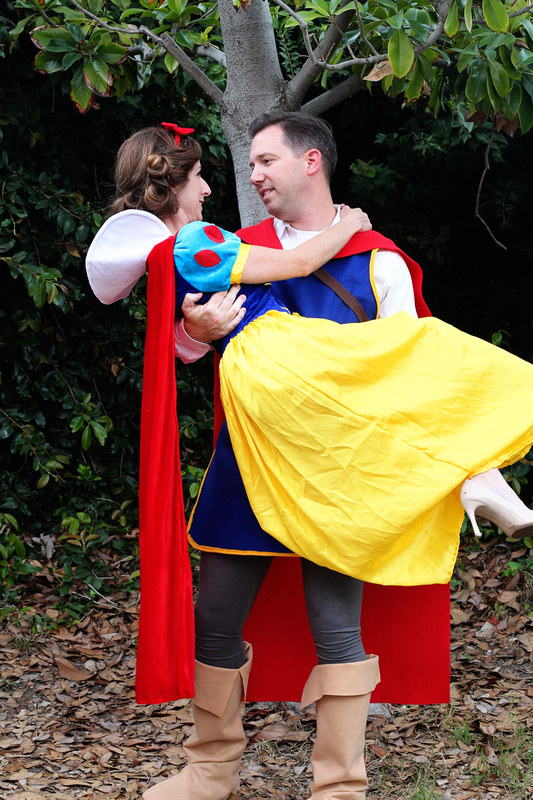 Love this DIY snow white prince charming costume! I am trying to recreate for my 2 year old son. 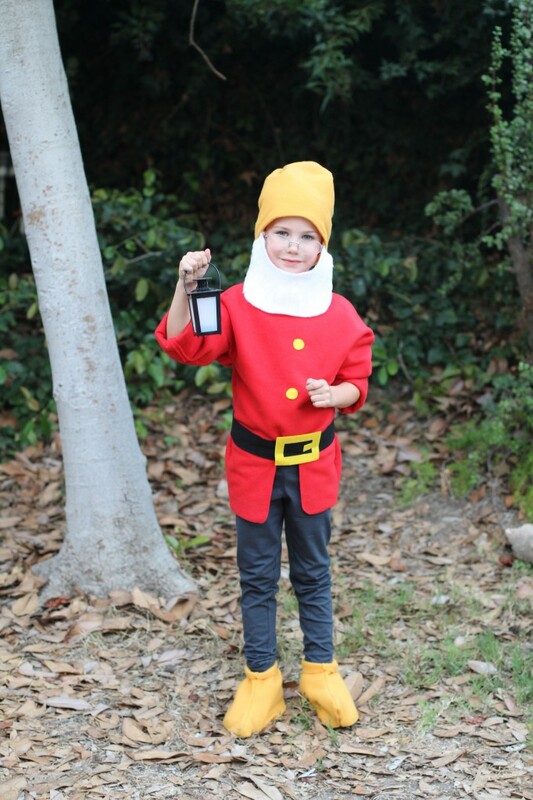 I was wondering what material you used for the tunic, shoe covers, and cape! Also, did you sew together the shoe covers?